Last weekend when I visited the Karapiro Prime Meat stand I asked if they’d been able to source a good supply of chicken yet. We’d suggested it ages ago thinking of our own stomachs! They explained that they’d been working on a good supply of free range chicken and that they hoped to have some for sale either this weekend or next. So this weeks recipe uses a combination of items from several stallholders and it was really easy for Mike to follow my instructions while making. The taste was great. 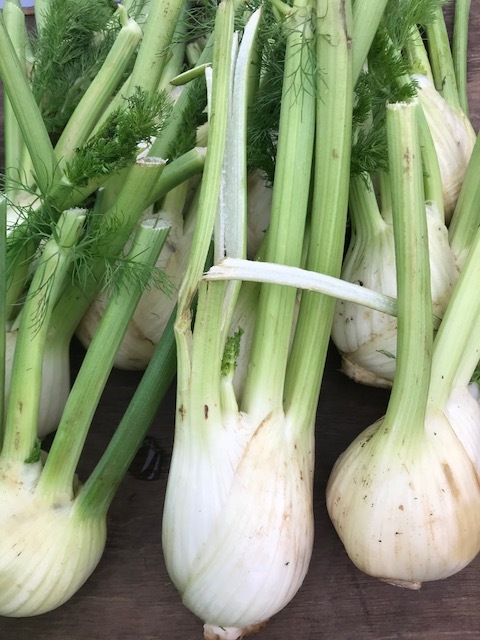 I brought Sicilian pesto from our stallholder Dario on Sunday and had picked up the pistachio pesto by accident -I thought I had the wild fennel version. 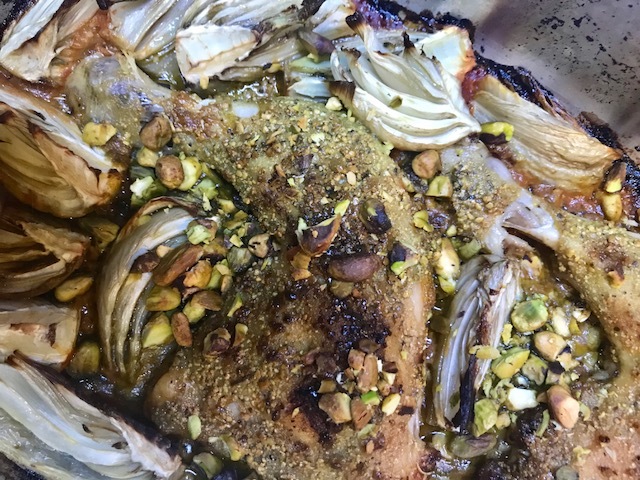 So this recipe is a combination of roasted fennel pieces, pesto and topped with fresh pistachios that I’d already brought from Tahsin our Turkish stallholder. So, buy the chicken pieces from Karapiro Metas, fennel bulbs from Arek, pesto from Dario and de-shelled pistachios from Tahsin and we have bottles of tomato passata. Ingredients – We made this for the 2 of us, so increase the quantities as you think depending on how much you’re cooking for. Season the chicken pieces well with salt and pepper on the flesh underside. Drizzle a little oil in an oven dish and place the chicken pieces on it skin side up. Add the passata and water mixed. Smear the pieces with the pesto. Bake for about 15 minutes and then add the fennel pieces to the dish. About 10-15 minutes before the chicken is cooked (ours took about 45 minutes all up) sprinkle the chicken pieces with the chopped toasted pistachio nuts. Test the chicken pieces to ensure they are cooked. We served this dish on a bed of freshly cooked pasta. 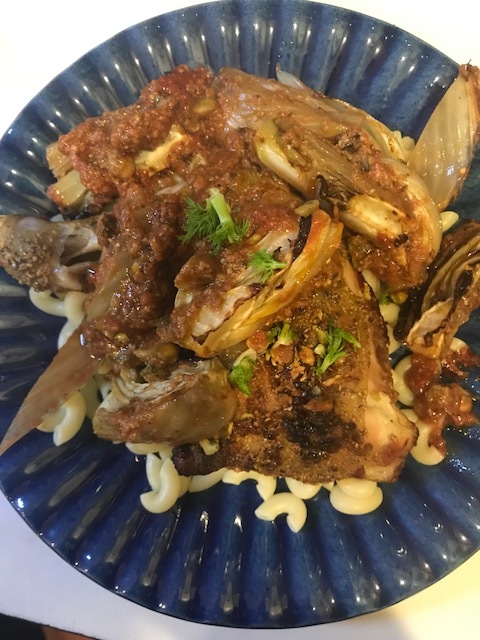 Mike put the chicken pieces on top, the roasted fennel around and then the passata on top. Its was delicious and definitely a quick and easy dish to have regularly.